Clarity determines the purity of a diamond. Sometimes due to the retention of carbon, a diamond may appear impure. Such natural impurities found in diamonds are called Inclusions. The lesser the inclusions, the higher is the Clarity of the diamond which makes it appear eye-clean, pure and therefore more expensive. FL(Flawless) - Diamonds that are absolutely flawless i.e., no inclusions or blemishes are seen to a skilled grader using 10x magnification. IF(Internally Flawless) -Diamonds those have no inclusions, but slight blemishes appear externally to a skilled grader using 10x magnification. 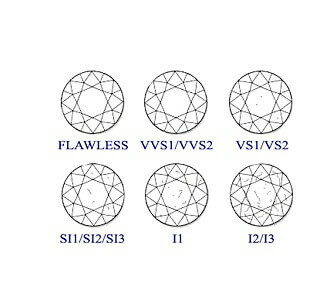 VVS1, VVS2(Very, Very Slightly Included) - Most sought after diamonds with very-very small inclusions internally even difficult for a skilled grader to identify under 10x magnification. They are highly priced as these inclusions are never visible to naked eye. VS1, VS2(Very Slightly Included) - Diamonds with very slight inclusions clearly visible to a skilled grader using 10x magnification. 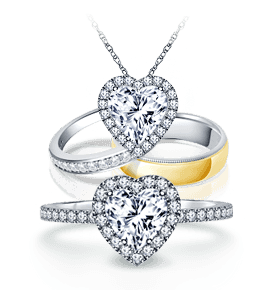 VS1 and VS2 diamonds are very affordable. SI1, SI2(Slightly Included) - Diamonds with slight inclusions noticeable to a skilled grader using 10x magnification. I1, I2 and I3(Included) - Diamonds with inclusions obviously visible under 10x magnification and may effect transparency and brilliance. If you prefer a diamond with no inclusions visible to the naked eye, then VS1 or VS2 would be an ideal clarity match for you. 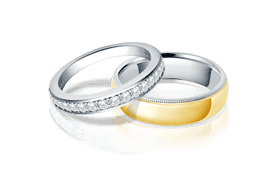 However diamonds with SI1 or SI2 clarity are also a neat choice and are generally referred to as Eye-Clean Diamonds. What is the definition of Eye-Clean? We define an eye-clean diamond as no inclusions seen in the face-up orientation at a distance of 25cm, under normal lighting, when viewed by a gemologist with 20/20 vision. Although there is not an industry standard definition of an eye-clean diamond, our definition is derived from three factors: distance, lighting and vision. For a person with normal 20/20 vision, the 'near point', defined as the closest point that an item can be viewed by the eye without appearing blurry under normal lighting, is 25cm. By incorporating an expectation of 'near point' (25cm) viewing, normal lighting, and 20/20 vision our definition of 'eye-clean' gives a realistic baseline for all diamonds - whether loose or in a jewelry setting. 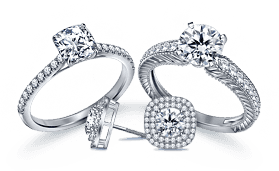 B2C Jewels offers Loose Diamonds with a wide selection of clarity grades to suit your taste and budget.